“Work-life balance” is the catchphrase of the 21st century workforce. They are ambitious and driven and ready to face their demanding careers, but many now recognize the importance of a holistic lifestyle. 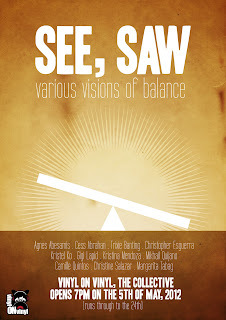 "See, Saw" will feature paintings, photographs, installations, and digital and mixed media works by 11 different artists and individuals who are woven together by the common thread of passion in pursuing art, regardless of their day jobs and chosen fields. It will include contributions by Agnes Abesamis, Cess Abrahan, Trixie Banting, Christopher Esguerra, Kristel Ko, Gigi Lapid, Kristina Mendoza, Mikhail Quijano, Camille Quintos, Christine Salazar, and Margarita Tabag. This undertaking is particularly relevant because of the modern Pinoy’s increasing inclination to engage in other life-enriching activities centered on general well-being. The exhibit’s focal point – life balance or sometimes the lack thereof – will prove to be an eye opener for anyone who has been challenged to achieve their own version of success, without compromising other valuable pursuits. The exhibit will be held at the Vinyl on Vinyl gallery at The Collective in 7274 Malugay Street, Makati City. The exhibit opens on May 5, 2012, Saturday, at 7pm and will run until May 24. Visit the events page of “See, Saw: Various Visions of Balance” on Facebook for more information about the event.